RZD (Russian Railways) gondola car #0083, type 12-296-01 #52494211 empty and with various loads. Manufacturer - AVZ, owner - "Transfin"). ATTENTION! 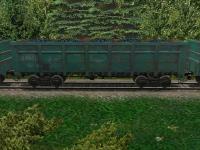 FOR CORRECT USING OF THIS GONDOLA YOU NEED TO DOWNLOAD SOUNDS #2 FOR FREIGHT CARS AND CARGO PACK FOR GONDOLAS #1 AND PATCH 1.1,1.2,1.3 FROM THE SITE http://www.trainsim.ru!